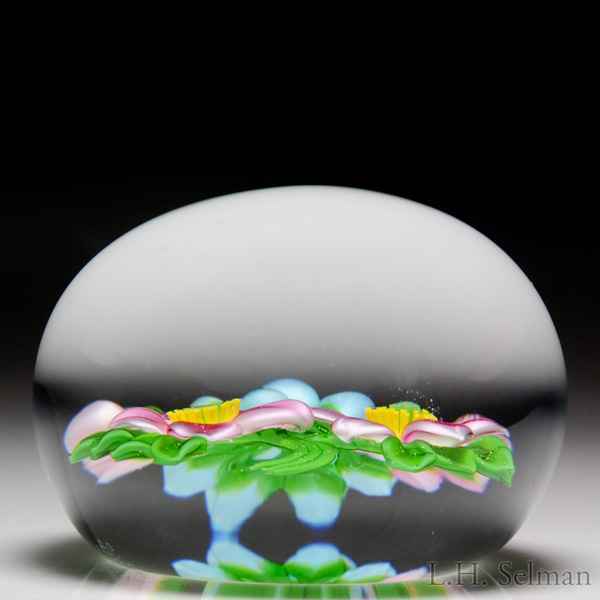 David & Jon Trabucco 1989 pink and blue bouquet paperweight. Two prominent five-petaled satin pink flowers, with rings of bright yellow stamens, are topped by eight pale blue blossoms, with white filament stamens, flanked by two pairs of pink buds. Fans of four leaves frame the motif on either side, and curving stems trail below. Clear ground. Signature cane. Signed/dated. Diameter 3".